Klondike solitaire is a basic patience game that is simple to set up, simple to play, but difficult to win. It requires a standard 52-card deck of cards (no jokers). (Refer to the diagram) Place a single card face up on the left hand side of the field. Place six more cards in a horizontal line, face down. Place a single, face up card on top of the second pile, and then place a second row of face down cards on top of the others to the end of the field. Continue, turning one more card face up each time until there is an ascending order of stacked up cards, each with a face up card atop. Place the remaining cards in a pile at the top of the field. This is the waste pile. The goal of Solitaire is to stack all the cards in their four foundations (piles), one for each suit, in order, from Ace up to King. If you can accomplish this within the rules, you win! Moving cards to their foundation stacks can be done from both the field and the waste pile. A card can only move to the foundation stack if it is the one needed in its particular (suited) foundation pile AND no card/s are on top of it (either in the field or the waste pile). So, if you look at the diagram above, the ace of spades should be moved up to one of the foundation piles. From there, we would be looking for any of the other three aces, or the 2 of spades. In the field, red cards are played on black cards, and vice versa in descending order. Players may move any of the revealed (face up) cards on the field to any appropriate place. If there is a line of cards, like a black 8, red 7, black 6, red 5, and there is a red 9 revealed somewhere else in the field, then the entire line (8,7,6,5) may be picked up and moved to that 9. Moving cards around in the field will reveal faced-down cards, which can then be flipped over and revealed. So, to continue this example, after the line of 8,7,6,5 was moved onto the red 9, a stack of faced-down cards were left behind. The top card of that stack would be flipped right-side-up and play would continue. If there are no cards lefts on a particular space in the field, Kings (with their lines, if any) can be moved to that location. Strategically, players should move as many field cards as they can before flipping waste cards. 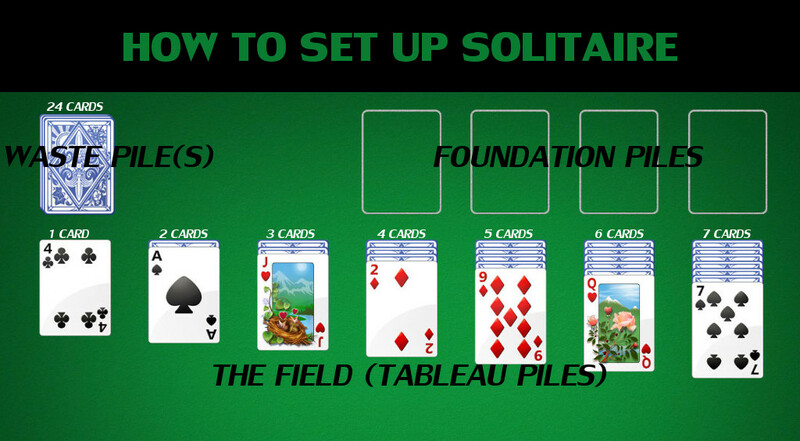 There are many variants to solitaire when it comes to waste cards, but the most common rule is to flip over three at a time (revealing only the top card) and setting them next to the pile (which begins the faced-up waste pile). The revealed card can then be moved to the field or to its foundation stack, if able. Like the field, playing a waste card will reveal another faced-up waste card, which can then be moved. If all of the waste cards get flipped, the whole stack is just flipped back over and play resumes. Some variants allow players to only flip through the waste pile three times, but most have no limit. The cards continue turning and re-arranging until either all have been revealed and moved to their foundation stacks (win), or no more moves can be made (loss). The odds of winning (from rositurnbull.com) are about 1 in 11.5 games. A great way to learn how to play solitaire is by playing on your computer or your phone.